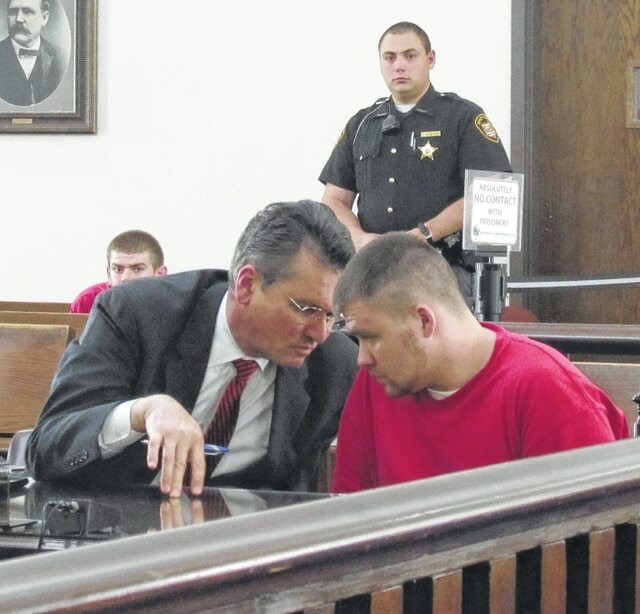 Kyle Ross is shown in Highland County Common Pleas Court on Tuesday as he consults with defense attorney Leo Mulligan. A Leesburg man was sentenced to nine years in prison as part of a plea agreement reached with the state on a case in which he was indicted on 17 drug-related charges. Kyle Ross, 25, pled guilty Tuesday in Highland County Common Pleas Court to engaging in a pattern of corrupt activity, a first-degree felony. The maximum sentence for the offense is 11 years. The other 16 charges against him — all drug possession and trafficking charges involving heroin, methamphetamine and cocaine — were dismissed. Ross also agreed to the forfeiture of items that included various guns, cell phones, and nearly $5,000 in cash. Indicted along with Ross in March were Nicky L. Kerwood, Jammie Hudson, Timothy Anteck and Kathy Ross. Kerwood, 27, and Anteck, 26, both of Hillsboro, each pled guilty to third-degree felony heroin possession and are scheduled to be sentenced next month. The cases against Kathy Ross and Hudson are still pending in the court. Later, Collins thanked Sgt. Det. Randy Sanders and Sgt. Det. Chris Bowen with the Highland County Sheriff’s Office, Det. Casey Lengefeld with the Hillsboro Police Department, and the Highland County Drug Task Force for their work on the case. Ross is also facing felony charges in Clinton County, according to the court. In other hearings, two defendants appeared in the courtroom for notification on probation violations and admitted to the allegations after choosing to proceed without counsel. Charles E. Bray, 23, Hillsboro, admitted to supervision violations that included his “walking away” from a treatment facility, according to assistant prosecutor Jim Roeder. Bray was initially granted intervention in lieu of conviction in the case in 2013 after pleading guilty to fifth-degree felony breaking and entering. When he violated that, he was placed on community control. Another violation got him ordered to attend a residential treatment facility. On Tuesday he was sentenced to 12 months in prison, but will be given credit for the time he previously spent in the STAR program. Similarly, Ryan E. West, 25, Hillsboro, waived his right to an attorney and admitted to alleged probation violations that included failing to report, taking someone’s vehicle without permission and causing property damage, possessing illegal drugs, and failing to complete court-ordered treatment. West was sentenced to community control nearly a year ago for fifth-degree felony aggravated possession of methamphetamine. He also completed the STAR program, judge Rocky Coss noted, adding that West apparently “walked right back into the life (he) left” upon his release from treatment. West was sentenced to 11 months in prison, but will be given credit for his time at STAR. In other proceedings, Thomas S. Spurlock, 31, Sardinia, pled guilty to fifth-degree felony aggravated possession of drugs and was sentenced to serve eight months in prison. Mark R. Behymer, 37, of Marshall, Mich., was sentenced to community control and treatment on possession of marijuana and possession of criminal tools, both fifth-degree felonies. He pled guilty to the charges in April. Jamie L. Williams, 22, Greenfield, pled guilty to fifth-degree felony breaking and entering and will be sentenced next month following a presentence investigation.